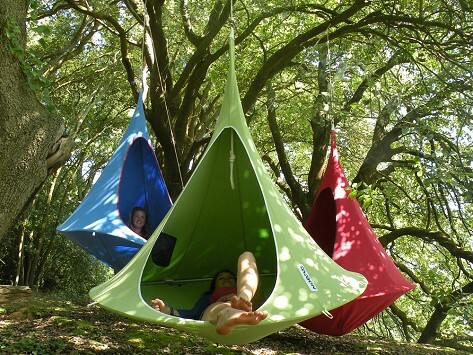 A cross between a hanging tent and a hammock, the Cacoon is a chic and cozy hideaway. Snuggle into the fully enclosed hanging chair to lounge or relax to your heart’s content. Warning: Maximum weight load of 440 lbs. Packs down to 7.8" x 27.6"
Packs down to 9.8" x 31.5"
Sometimes you just want to kick up your feet and hang out. From a company aptly named Hang-In-Out comes the Cacoon—an enclosed hanging chair with the appeal of a hammock and so much more. The design inspiration for this colorful, cozy hideaway comes from the hanging nests of weaver birds as seen by company founder Nick McDonald and his design team during a trip to Mexico. Formerly a competitive sailor, it’s no wonder that Nick chose to make the Cacoon out of the same high-quality durable materials used in marine and camping equipment. Treated for UV and water resistance, the Cacoon is made to weather all kinds of elements from the patio to the beach. Hang it by a tree or go out on a limb and hang it from a rafter or ceiling hook indoors. In an apartment, dorm room, or playroom, it’s a conversation piece and sanctuary all in one. Available in two sizes, the Cacoon itself is only 14 pounds, yet it has a weight capacity of more than 400 pounds, making it as easy to fold up and transport as it is to share with a friend. Feathering your nest has never been more relaxing.